Like many Scottish fortresses, the first Inverlochy Castle—which dates back to the 13th century—now lies in ruin. Its replacement is a castle-like Victorian baronial mansion completed in 1870 by Lord Abinger. Lord Abinger’s son James held the title for only eleven years, when he died suddenly without an heir, and the property passed to a second cousin whose family sold the estate in 1944 to Mr. Hobbs of Vancouver, Canada. His daughter-in-law, Grete Hobbs, formerly from Copenhagen, is credited with transforming Inverlochy Castle into the magnificent property we see today. When asked to come up with a list of over-the-top luxury castle hotels for the Discovery Travel Channel’s Uber Guide series, Inverlochy Castle was deservedly on my list. The atmosphere here comes from another era. You feel like youre a guest at a 19th-century aristocratic house. Take note if you’re bringing your kids, that aside from hiking, fishing, and golf, guests enjoy quiet pursuits. The hotel prides itself on offering guests total peace and seclusion; for this reason, hotel sightseers are not encouraged. 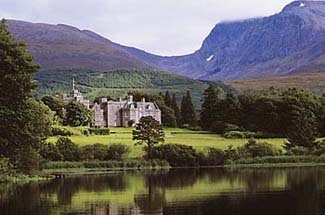 Inverlochy Castle is 3 miles north of Fort William. With prior notice the staff will arrange for you to be picked up at the Fort William train station, or even Prestwick, Glasgow, or Edinburgh International airports. Yes. Civil ceremonies. Exclusive use available. Today’s castle of gray stone turrets, merlons, and battlements sits in 50 acres of woods and gardens on the shore of Loch Linnhe. Though the outdoors reflects the untamed Highlands with its rugged coastline, stormy seas, and rushing rivers, you’ll find inside Inverlochy a world of refined elegance and luxury. A lovely frescoed ceiling and crystal chandelier highlight the two-story grand hall. Period furnishings, fine artwork, Oriental rugs, fireplaces, and gorgeous flower arrangements provide beauty and comfort in the public rooms, and a billiard table is available for the indoor sportsman. All of the guest rooms look out on Ben Nevis. They are furnished with chintz-upholstered chairs and sofas and feature large bathrooms stocked with bath oils and fine soaps. Dining at Inverlochy is a special experience. Earlier in the day you tell the staff your preference—whether it is wild salmon, Angus beef, or duck—and it is served to you that evening on silver and crystal in a dining room (jacket and tie required) overlooking the hotel’s private loch. After dinner you can take your Madeira or coffee into a drawing room lined with lovely mirrors and fine paintings and chat with other guests. In the morning, breakfast is brought to your room. When weather permits, lunch and tea are served on the terrace. Gorgeous location with stunning views of Ben Nevis.